Way back in July of last year, we wrote Part I of our post about air travel with your cat. Things got us sidetracked, but now we’re ready to finish our travel series. International travel with cats is often a complicated process that takes much planning and preparation. So here’s what you need to know to get started if you are planning to move with your cat someplace far, far away. First, a little background. International travel, especially to island countries such as Japan and Great Britain, requires 6 months or more of preparation. Hawaii, while not “international”, is an island state and has similar regulations. Most island nations and states do not have rabies and are very conscientious about maintaining their rabies-free status. Additionally, many do not have ticks or tick-borne parasites and are similarly vigilant about keeping these pests out. Be aware that several countries require a quarantine period of up to 6 months upon arrival. 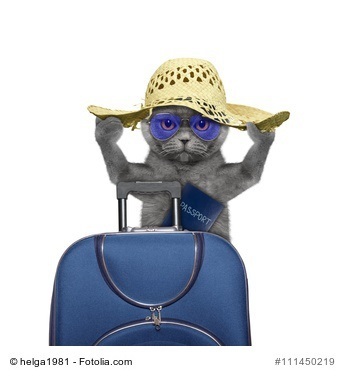 If you are planning to move your cat overseas, fasten your seat belts! It’s a fairly long flight, wherever you’re headed. As soon as you know you will be moving, ideally a year in advance but at least 9 months before departure, check with the country to see what is required. Information is generally available on-line. You may also check with the embassy of the country. The USDA-APHIS website has recently updated their Pet Travel page, and it covers information about most countries’ requirements. It is designed to be the go-to resource for both veterinarians and pet owners who need information on import or export requirements for pets. Another good resource for pet owners is the AVMA website Traveling with your Pet FAQS page. Check with your regular veterinarian to make sure they are accredited, which is required to fill out the necessary paperwork. Not all licensed veterinarians are accredited, which requires additional certification. At A Cat Clinic, our doctors are accredited, so you can call us at least 6 months prior to traveling to schedule a Consult for International Travel. Please fax or email to us the information you have obtained about your destination’s requirements at least 48 hours prior to your appointment. This gives us time to research and review the documents so we can provide you with the most accurate information at the time of your exam. Signature from USDA veterinarian at their office in Richmond, VA. It is important that you pay close attention to the required timing for each of these items. You don’t want to go through all this effort and find that you can’t take your cat because you didn’t get the proper signature or vaccination at the right time. There is limited availability to bring cats on board, so you want to book your flight as early as possible. Bringing your cat with you in the cabin is so much safer than shipping in cargo where delays are always a possibility. There are some countries/airlines where this is not permitted, however you should always try. If there is any flexibility in the time of travel, fall and spring with less drastic temperatures are preferred. During warmer months, try to choose an overnight flight. During colder months, try to depart and arrive during the daytime. Also, try to pick the most direct, non-stop (or minimal number of stops) flight available. Flying during the week rather than on a weekend may be helpful in case you need to reach a veterinarian immediately prior to departure or on arrival. Step 4. Check the airlines requirements for pet travel. Once you’ve booked your flight, check with the airlines regarding size and shape of cat carriers that they accept, and about their procedures regarding the cat’s care: will they check water during a stop? Can you provide a small amount of food? If there is room in the carrier, a small cardboard box (3-oz canned food boxes are ideal) with shredded paper is less messy than litter but gives the cat an area it can eliminate. Try to get the largest carrier that meets standards, so the cat has some room to move around during its time on the plane. Step 5. Get your cat acclimated to carrier. We’ve posted several articles about getting your cat used to the carrier, most recently Getting your cat used to the Carrier. But that is never more important than when your cat will be enclosed in the carrier in a strange environment with strange noises for many hours! Leave the carrier out well in advance of traveling so your cat can explore, and put an old towel or other bedding inside that will be familiar to your cat during travel. Affix a label directly to the carrier – tags can be torn off. The label should have the owner’s name, destination address and contact phone both for new destination and for original place of departure. If you have already moved and someone else will be bringing your cat in for the final local visit for the Health Certificate exam, review the documents and make sure your designated cat care-takers have all the required information. Minimum requirement is local destination address, contact email and phone. Now that you’ve spent months planning your trip, when the day finally arrives you want to be prepared for the actual flight. Here are some things to keep in mind. Bring important paperwork! Medical records and a recent color photo of the cat should accompany the cat. Tape a copy to the side of the carrier and carry a set with you. Line the carrier with disposable “puppy pads” or old towels that can be thrown away. Include the t-shirt, old towel or other bedding you’ve been leaving in the carrier while your cat was getting acclimated. The padding should be sufficient to provide a comfortable space for a long flight. Affix “Live Animal” stickers to the outside of the carrier if your airline does not provide them at airport. Unless the flight is over 12 hours, feed lightly about 2 hours prior to travel but don’t put food or water in the carrier (which is likely to spill). If the flight is longer, get airline-approved bowls that can be affixed to the carrier for stability. Attach a letter of instruction regarding feeding and watering your cat if your cat is traveling in the cargo area. Also attach a small bag of food. If there is a layover and the flight is delayed, or if you should be separated from your cat, the airline personnel will know how to care for your cat. Arrive at the airport early so you are not rushed. Ask for a private room for security screening of the carrier. That way if your cat escapes, you are not chasing all over the airport! If your cat is traveling in the cargo area, notify the flight attendant that your pet is there. Whew! You can see that international travel with cats takes a LOT of preparation. But with enough advanced notice, and diligently following through in a timely manner on all the steps, we can help make it go as smoothly as possible. Bon voyage!